Los Alamos, NM . . . 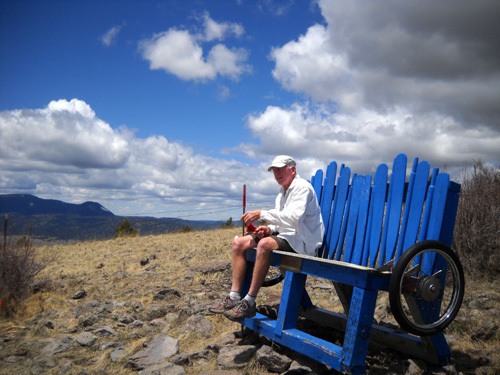 It has 40 trails on 300 skiable acres, 1200 feet vertical . 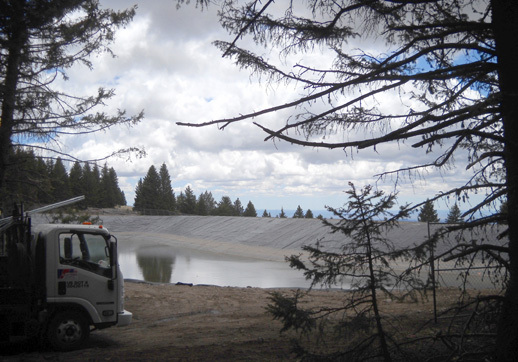 . .
and lift-served downhill mountain biking and hiking." 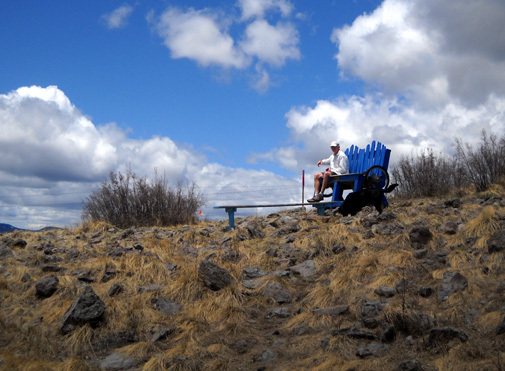 What self-respecting ultra runner (or recently retired ultra runner) wants to catch a ride to the top of the mountain to run down it??? Not us. Even with bad knees, I can still climb up mountains. It's coming down that hurts. That's where I need a ride! I can go UP on my own. How about a ride back DOWN?? Since neither of us is acclimated to 10,400+ feet yet, going up was a bit slow but at a steady pace with some breathers to check out the views and take pictures, we made it from the ski lodge up the service road and a trail to the top of the mountain and back down via road, trails, and the ski slopes (!) in a pretty fair time earlier this week. 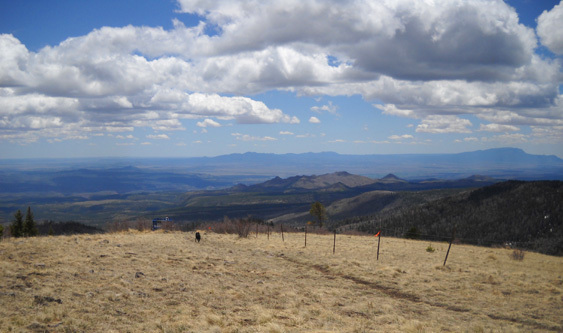 So Jim could get some acclimation for the Jemez Mountain 50K tomorrow and I could see the great views from the mountain while I'm still able to climb it. I'm not one to turn down an opportunity to climb a mountain with decent footing. The grade of the dirt road was gentle to moderate, with wide swooping switchbacks, unlike the insane vertical of most of the ski runs we crossed at least twice. Of course, these photos don't begin to illustrate the steepness. You have to stand there to get the true perspective. Looking up and looking down at some of those slopes just about made us dizzy, not the altitude. I'll never understand how folks can remain upright on skinny skis hurtling down snowy mountains like that!! The few times I tried cross-county skiing on barely undulating terrain a decade ago I couldn't stay upright on the slightest little downhill slope. Even then, I did better going uphill than down. We were amused by the names of some of the dozen-plus ski runs we crossed on the service road on the right half of the mountain: Wildcat, Big Mother, 'Nuther Mother, Sidewinder, Breathless, Precious (those last four are marked "experts only"), One More Time, I Don't Care, Why Not . . .
Why not, indeed? Seems like we chose to hike up the service road on the side of the mountain with the toughest runs, the steepest of which has a 37% grade. Yikes! 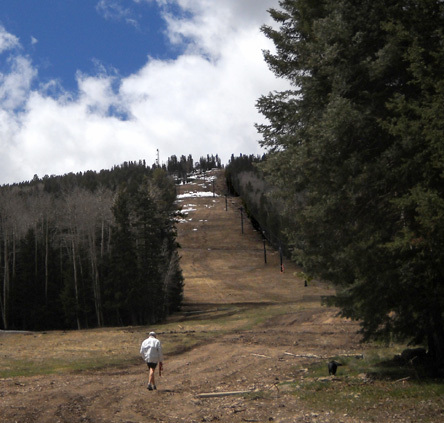 See the faint trail coming down the Aspen ski run / chairlift? 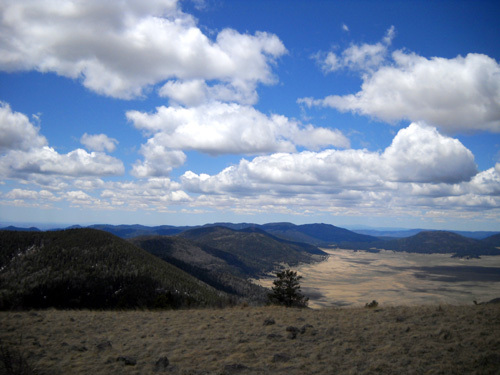 That's part of the 50-mile Jemez Mountain race course. 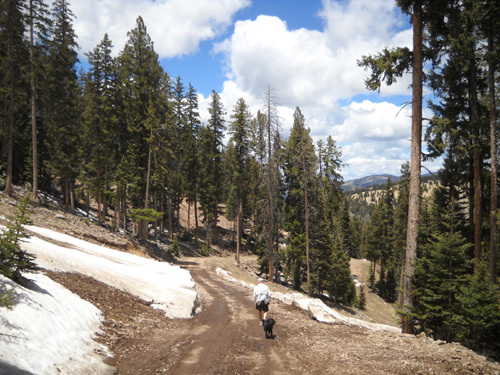 The upper trails and roads and a steep descent down one of the ski slopes (above) isn't even on the 50K course, but Jim wanted to find where he went wrong last year going up the mountain and coming into the ski lodge aid station during the 50-mile race. 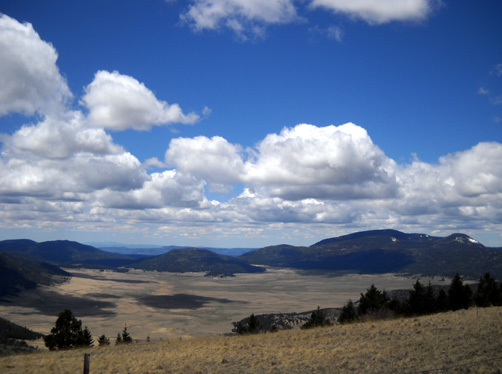 He got lost on the south side of the mountain after coming out of the Valles Caldera portion of the race and missed the AS cut-off. 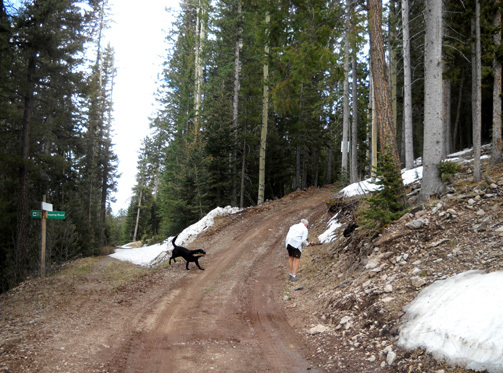 He wanted to make sure he could find the correct section of the 50K course leading to the aid station this year. We don't think we found it but we had a heck of a good time climbing and descending other parts of the mountain! 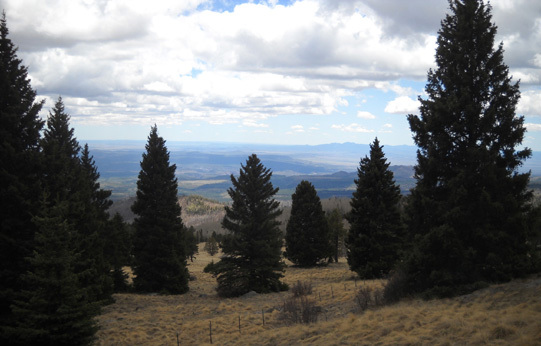 There are no leaves yet on the aspens above 9,000 feet. 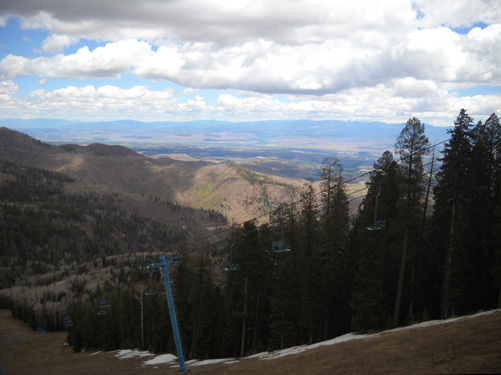 The Los Alamos Ski Club owns 750 acres of Pajarito Mountain, pronounced something like "Pa-REET-o" by locals. 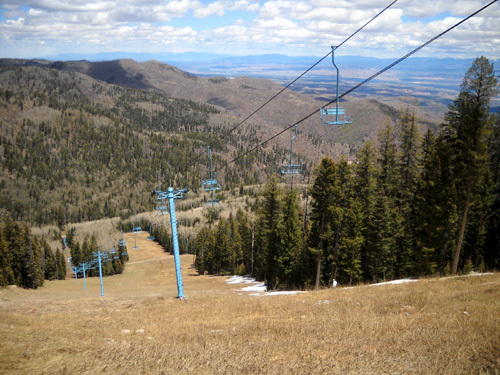 It is open to the public for skiing in the winter and mountain biking and hiking in the summer. 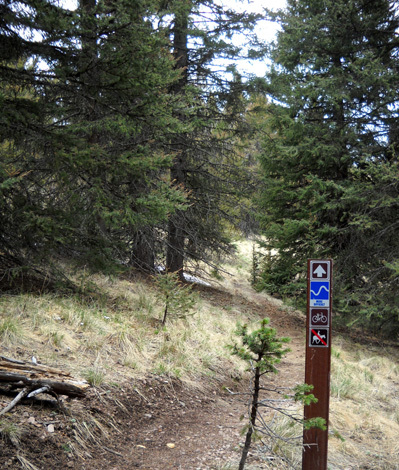 There is no charge to just go in, park, and run/hike as much as you want. 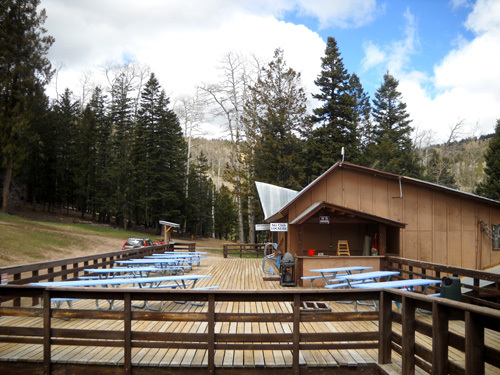 The ski lodge is open in the summer for meals. 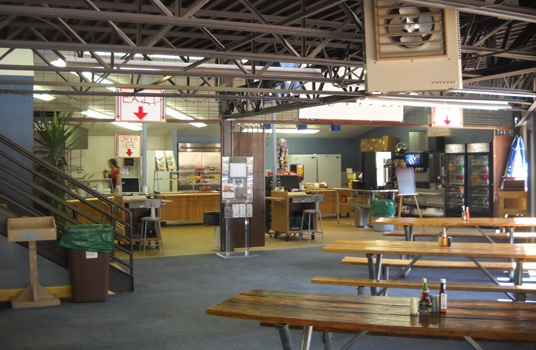 There is no overnight lodging at any time, however. 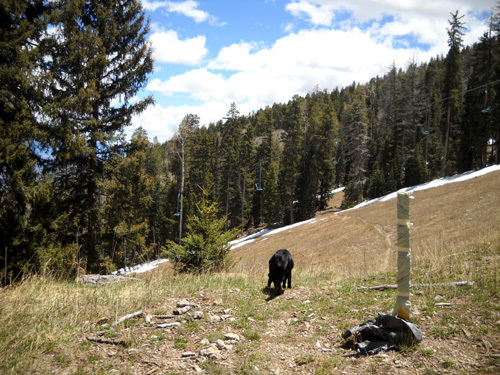 We parked below the lodge, scouted around for trails, and began walking up the service road to the right. 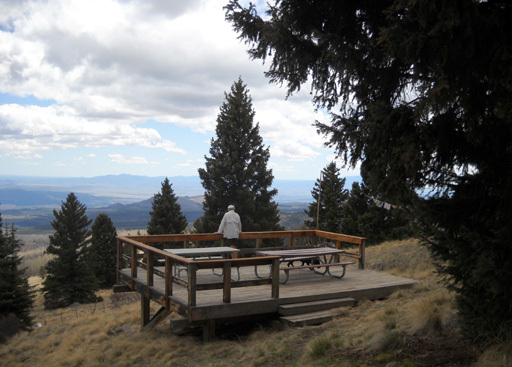 It was about two miles to the point near the top where we turned around, just past the big blue bench that overlooks the caldera. 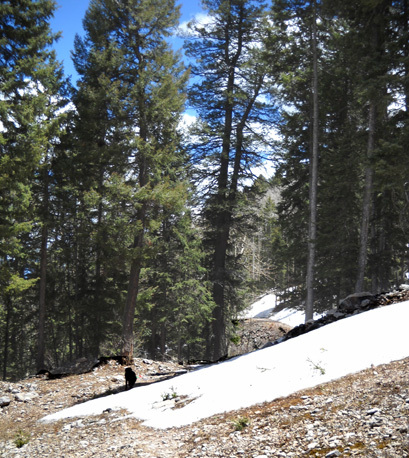 We soon found snowdrifts in shady spots along the road and in the woods as we ascended from 9,200 feet. Cody was ecstatic! S-N-O-W is not the four-letter word to him that it is to Jim. 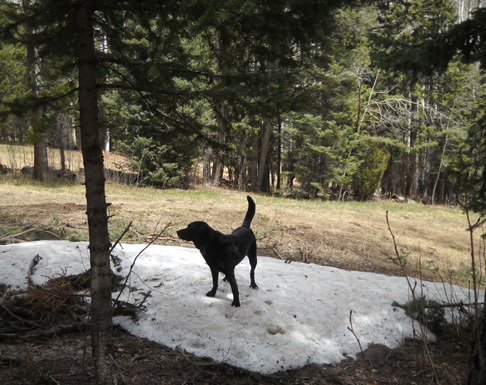 Cody often spots a good patch of snow before we do. He just races toward it, hurling his body into the soft center and rolling around on his back Too funny! Cody retrieves one stick while Jim hunts for another one. You just can't have enough sticks! On the way up the road we saw several trails used in the summer by hikers and cyclists. I made a note of those for my descent. 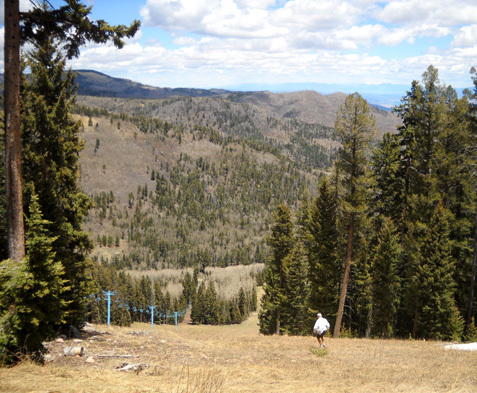 Jim's plan was to find the trail below the Aspen chairlift that is used in the 50-mile course and drop down it on the way back to the lodge. 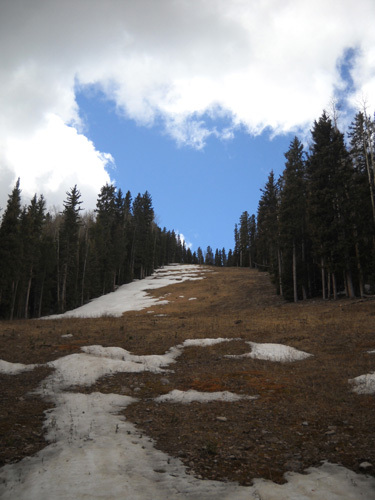 We could see the faint trail through the ski run when we crossed it on our ascent (photo farther up in this entry). 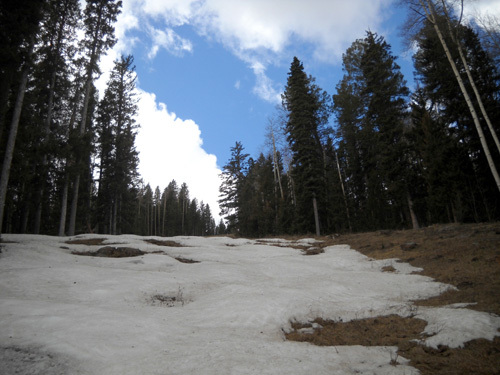 Considering all the snow we still saw in mid-May, it was hard to believe they needed to make any more during the winter. Jim stopped to talk to the guys for a few minutes while Cody and I investigated further up the road. My favorite fellas do some male bonding on the deck. 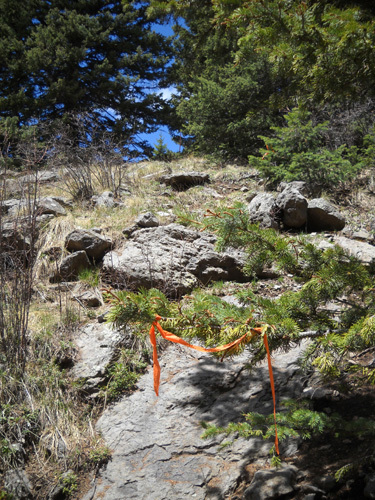 Nearby we saw a trail that was marked with orange flagging. Jim recognized it as part of the 50-mile course. 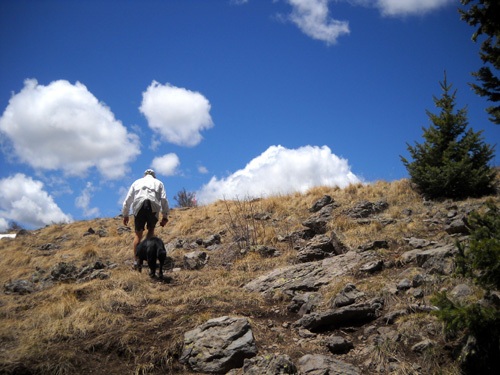 We followed the trail up a short, rocky section and viola! The bench is so big it dwarfs its occupants! 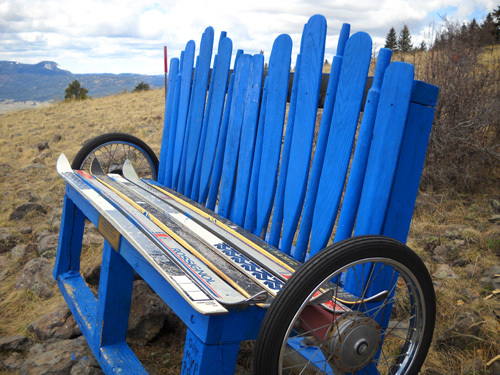 Skis and bike tires: how appropriate! The oars, less so. He won't be going past the bench this year in the 50K but it's a great overlook and I'm glad I went far enough to see it. 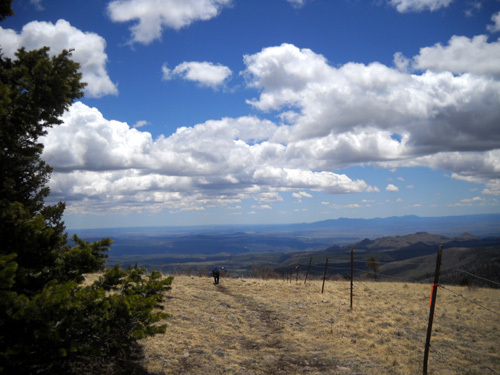 Runners in the 50-miler do a loop down in the 89,000-acre caldera, an ancient volcanic crater, before climbing Cerro Grande and Pajarito mountains. Last year we drove on NM Hwy. 4 past the Caldera and I got some photos of it from the road and a mountainous trail on the south side of it. 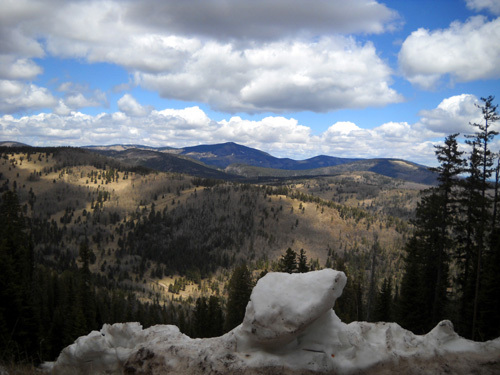 After about fifteen minutes absorbing the views we reluctantly turned around for the descent. Jim follows race flagging back down to the service road. 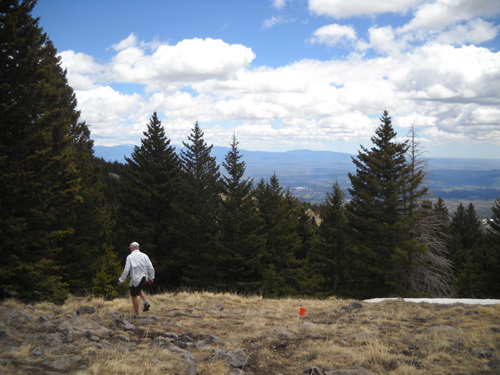 Above and below: Jim quickly descended the ski slope, following the 50-mile race trail. 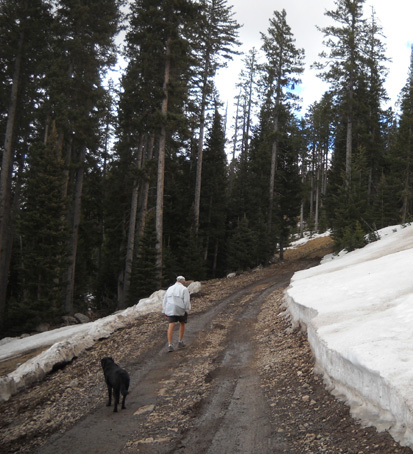 My plan was to either descend on the road or find one of the trails with an easier grade than those crazy ski runs. 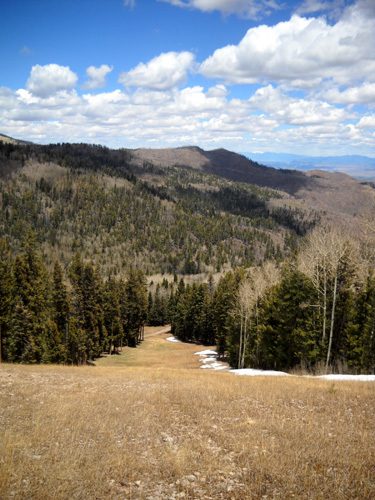 I kept going on the road another quarter mile, then just couldn't resist the urge to switchback down on another ski slope to a trail I could see halfway down. I wasn't sure it it ever descended to the lodge anyway, so I ended up dropping down the bottom portion of the Wildcat Trail (below) to the service road. To mitigate the pounding of a straight descent on my knees, I zig-zagged back and forth across the grassy, rock-strewn slope. Cody was puzzled at first, wondering why I didn't just go straight down (I wasn't on any path, just going cross-country). It was funny to watch his reaction every time I zigged and he zagged. What is that crazy woman doing?? It didn't take him long to figure out that he could descend in a straighter line and I'd always come back toward him. Smart dog. 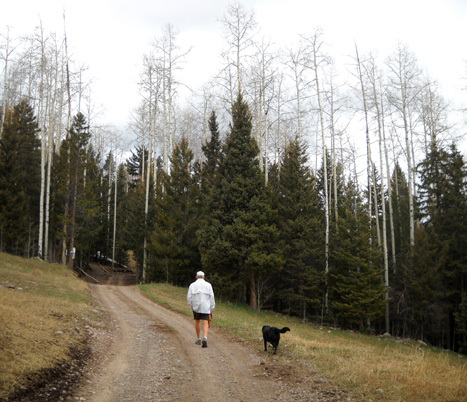 In retrospect, I should have just switch-backed down the Aspen slope behind Jim. Jim saw me coming along the service road from the lodge. He'd already eaten most of his lunch by the time Cody and I got down there. I ordered a spicy bean and cheese burrito at the cafe and ate it while we talked happily about all the fun we'd had on our little trek! It was short but memorable. Both of us noticed that it was harder to breathe as we climbed up the mountain but we did pretty well otherwise with the significant altitude. Neither of us was dizzy, nauseous, or had a headache. Of course, we weren't pushing hard like during a race. 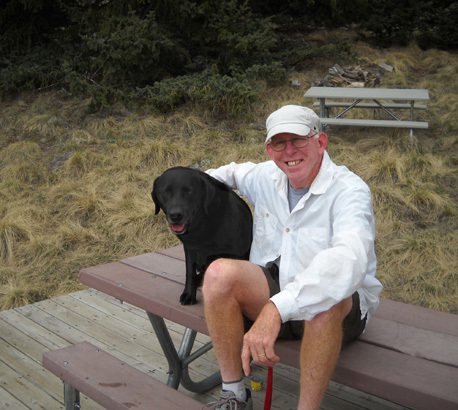 Although Jim won't be going to the top of Pajarito Mountain during the 50K, he'll be getting higher (10,480 feet) on Caballo Peak. Mountains sure make me happy, especially ones with a great view on top. I rue the day when I absolutely cannot climb them any more.